There was a small protest last week in the capital Muscat last week, with around 300 people calling for greater democracy and jobs. 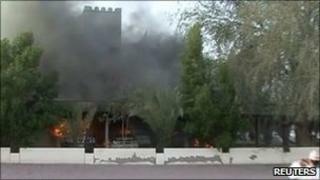 Reporting Sunday's disturbances in Sohar, the state-controlled Oman News Agency said a number of demonstrators were involved in "riots" that resulted in public and private property being destroyed. "The police and anti-riot groups combated this vandal group in a bid to maintain the safety of the citizens and their properties which resulted in some injuries," it said. An official who did not want to be named told AFP news agency: "Two were killed after being shot with rubber bullets as protesters attempted to storm a police station." On Saturday the ruler, Sultan Qaboos bin Said, changed six ministers in his cabinet in what he termed "the public's interest" and announced that social benefits for students would be boosted. The oldest independent state in the Arab world, Oman has been ruled by Sultan Qaboos since he seized power from his father, Sultan Said bin Taimur, in 1970. There is an elected Consultative Assembly but not all Omani adults are eligible to vote in elections for the Assembly and it is purely advisory, with no legislative powers. The oil-rich country is a popular tourist destination and a long-standing ally of the US and Britain.